The January snow continues. We are up to a couple of feet, with more on the way. Skiers and snowmobilers rejoice, and the rest of us get good photo opportunities. We have icicles too! Our friend Priscilla posts pictures of her home in Wolcott covered with them along with six feet of snow. We are happy that we live further inland from Lake Ontario and are content being "baby cousins" at this end of Wayne County. 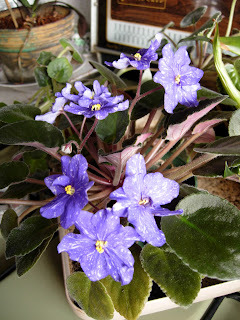 The African violets brighten up our spirits. They seem to have no particular season, but produce new blossoms all year long. It is no wonder they are such a popu lar indoor plant. Our Florida orchid continues to develop. The long stems of flowers reach for sunlight as they spread out from an inner-wall spot. Their friends are across the room in a south window and are starting to show swelling buds that promise color in another few weeks.